With each Smashing Pumpkins album, singer, guitarist and producer Billy Corgan has raised the bar for his grandiose ambition: to create the defining coming-of-age music for his generation. 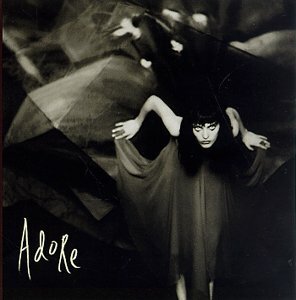 Gish (1991) packed a neopsychedelic arena wallop into its modest pseudoindie framework; Siamese Dream (1993) heralded the return of the multitracked guitar opus, a Boston album for the alternative nation; and Mellon Collie and the Infinite Sadness (1995) spread its farewell-to-youth concept over two rock-opera-length CDs. Heck, even this band’s leftovers came out as a box set (1996’s The Aeroplane Flies High). So what’s an auteur to do for an encore? In Corgan’s case, he makes a weird little album that turns its back on the band’s previous strengths and shrinks the Pumpkins’ sound. This isn’t just a transitional record; it’s a complete break with the past. Instead of stadium-size bombast, Adore dials down the volume to lullaby level. Instead of rat-in-a-cage rage, the new album overflows with heartsick valentines. Corgan doesn’t break out his trademark yowl but sings with an almost androgynous delicacy, sometimes supported by little more than a piano or a guitar. It’s a startling strategy: For a comparable move, imagine that Bruce Springsteen had released his stark Nebraska after the towering Born in the U.S.A. For Corgan, Adore represents a deflating of expectations even as it broadens the boundaries of his band. If the Pumpkins seemed to be turning into stadium-rock behemoths on their last tour, the new album presents Corgan, bassist D’Arcy and guitarist James Iha as pop changelings who are bolder, quirkier and more versatile than anyone may have imagined. A handful of tunes employ Nitzer Ebb programmer Bon Harris for a spritz of electronica, notably “Ava Adore” and “Perfect,” which picks up on the synth-pop echoes of the 1996 Pumpkins hit “1979.” But mostly the electronic textures are used to enhance this soundtrack for a sleepless night, with crickets chirping, asteroids drifting and lovers murmuring. It’s the most intimate album the Pumpkins have ever made and also the prettiest, a parade of swooning melodies and gentle, unfolding nocturnes. In some ways, the album’s more confiding tone can be viewed as a response to the departure of drummer Jimmy Chamberlin, whose splashy, storm-trooping way with a backbeat helped turn the Pumpkins into the altrock version of a fabulously overwrought muscle car. For Adore, the band called in a variety of percussionists, but they’re allowed little more latitude than the drum machines. Instead of building towering highway anthems, the Pumpkins keep the songs only several steps removed from bedroom demos. The shift in tone is as refreshing as it is unexpected. Corgan sounds more vulnerable than ever, his voice cracking with weariness on “Annie-Dog” and embracing a heavy-lidded sensuality on “Shame” and a desperate, heart-breaking optimism on “To Sheila.” His music strives to preserve the beauty of that innocence, while his lyrics acknowledge its inevitable corrosion. Corgan’s aching romanticism — the sensitive soul sinking in the muck of the real world even as a better one fills his dreams — has been a constant theme of the Pumpkins’ records, and his lyrical imagery is packed with oblique, private longings and weighty, sometimes awkward conceits. But on Adore, the words — like the music — are more direct and frequently disarming in their beauty. On “Shame,” he exhorts a friend, a lover, perhaps himself, to persevere, and then offers solace: “Love is good, and love is kind/Love is drunk, and love is blind.” The words are a soothing mantra, but the disorienting wobble of a distant guitar hints at irresolution. With the closing seventeen seconds of solo piano music, Corgan amplifies that theme in even more compact fashion, this time without any words at all. Just as the lovely melody begins to lift off, it ends abruptly, as if Corgan is reminding his listeners that nothing should be taken for granted. Least of all his band. Joey Waronker – drums on Perfect, additional drums on Once Upon a Time and Pug.